I feel great today! Things are back to normal. Working late hours throws off my whole schedule, but now I am back to my regular routine! For the past couple of days, we had dinner and lunches out and I am so happy to be home and make my own dinner. Funny how you miss cooking! I don’t mind being served food, but I was missing my creative side. 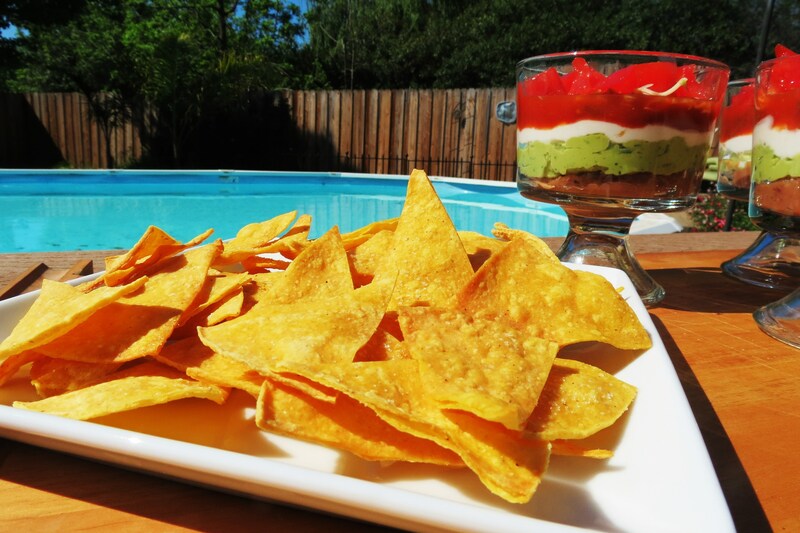 So with all that said, I have a wonderful, fun, low-calorie, 6 Layer Taco Dip, just for you! 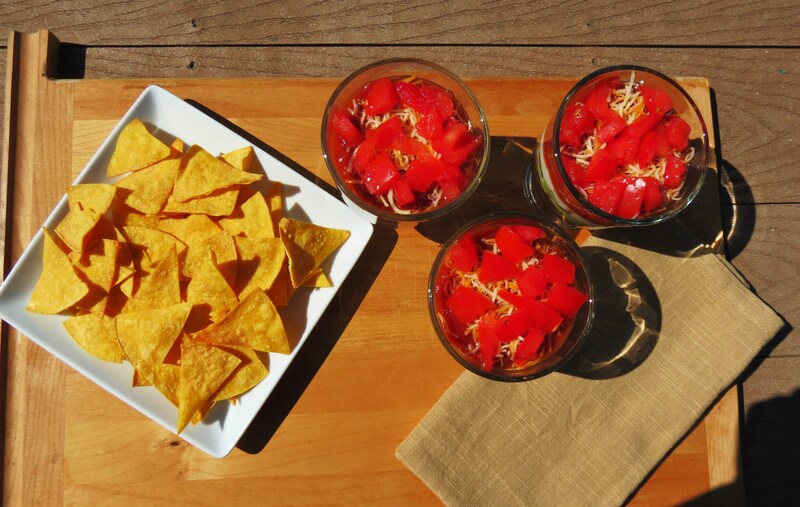 This dip is full of lots of fun flavors! 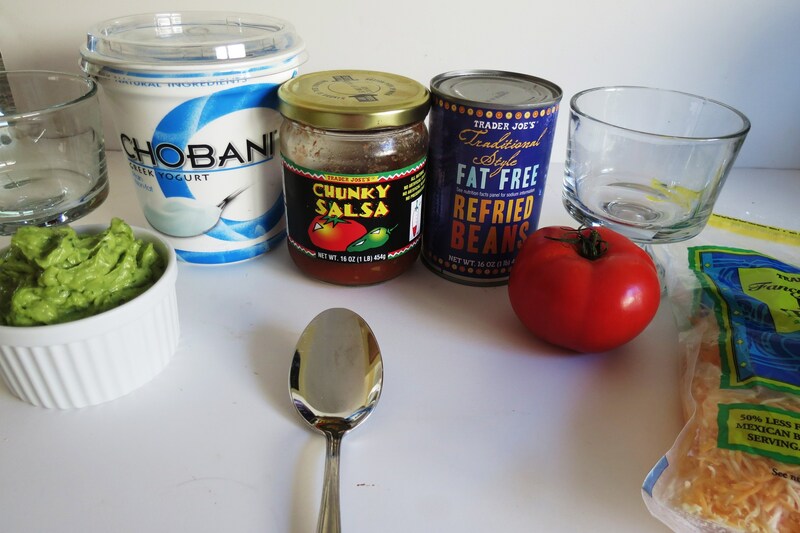 I layered with refried beans, my homemade guacamole, which I posted yesterday, Chobani Greek Yogurt, Salsa, Cheese and diced tomatoes. The flavors come together wonderfully! Every time I go to Trader Joe’s I see there 7 layer taco dip and I always want to buy it, but I know I couldn’t eat it all, well I probably could, but would feel to guilty, so I thought I’d serve my dip in little ice cream bowls, so it will get eaten and I was right!! Who can resist such a cute colorful dish? I love portion controlling my dip, that way I don’t go overboard on my dipping, you know it can sometimes be too easy to just keep eating it. This portion makes about a cup, which may not sound like much, but trust me this is pretty filling!! 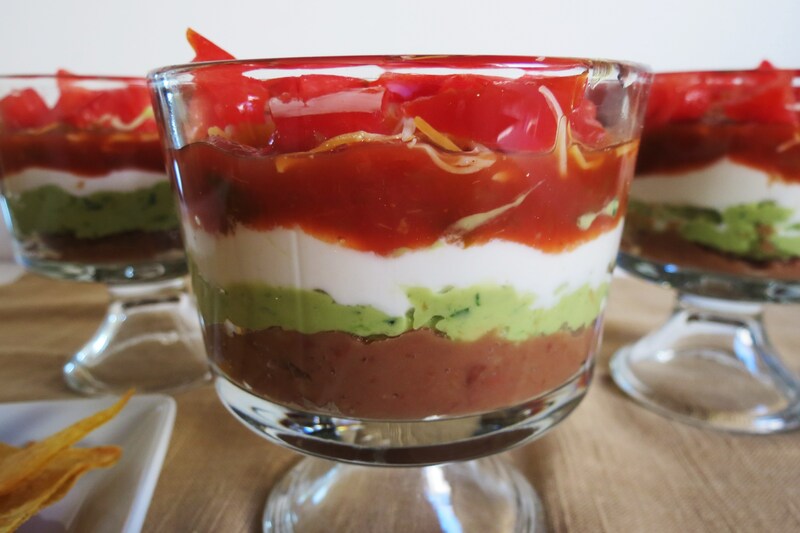 The calories for one of these little cups of Mexican heaven is under 200 calories! You have to love that!!! 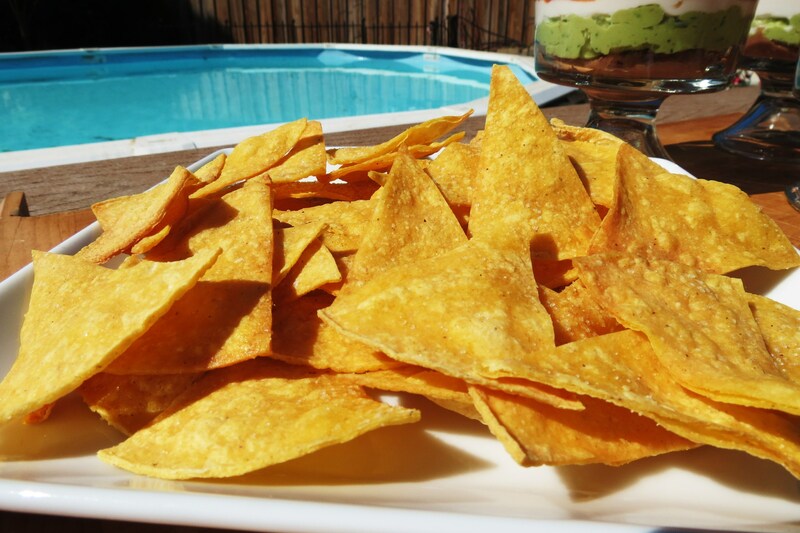 I also made homemade tortilla chips, which I liked, but to be honest my Husband didn’t like them at all. I used mission corn tortilla shells, cut them into 6ths, sprayed them with cooking spray and sprinkled with salt and baked them on 400 degree oven for 10 minutes or until crispy. They tasted good to me, but like I said he didn’t care for it. However he likes fried tortilla chips and I don’t mind baked ones. Off the subject of my tasty 6 Layer Taco Dip, today (Wednesday) was the first day I exercised all week, and boy was it hard to get back into to doing it. I did Jillian Michaels No More Trouble Zone and that workout is so long. It’s like 50 minutes of working out and 5 minute cool down. My arms are so sore from it, which is a good thing. I need a hard workout considering I ate so much bread and even had a chocolate mousse for dinner the other night. Eck!!! I have to be extra good this week, which I seem to be doing well so far, but it has only been a day. I decided last week that I would really cut down on white sugar, which I did! I didn’t have any added sugar last week! 🙂 Funny I did eat a lot of berries though!! 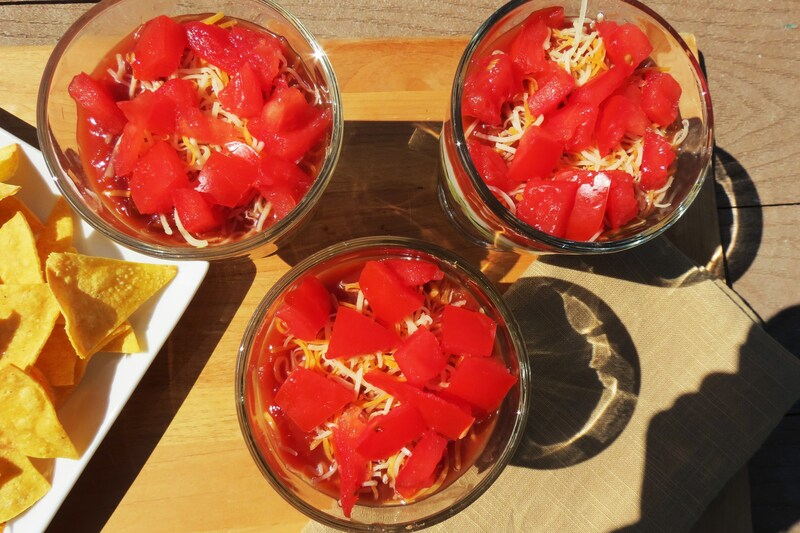 A healthy, delicious portion control Mexican 6 Layer Taco Dip filled with all your favorite Mexican ingredients. Perfect for serving at your next party. Repeat 3 more times with other glasses. Well my friends, time for me to go. Stop back tomorrow, I have a wonderful post that I can’t wait to share with you. Here’s one hint, it’s a giveaway!! And I’m giving away more than one! That’s all I’m telling you! Yay for getting back into your groove! I feel so off when I’m unable to exercise or eat homecooked food for a while…but it feels so great to get back to it when I do! 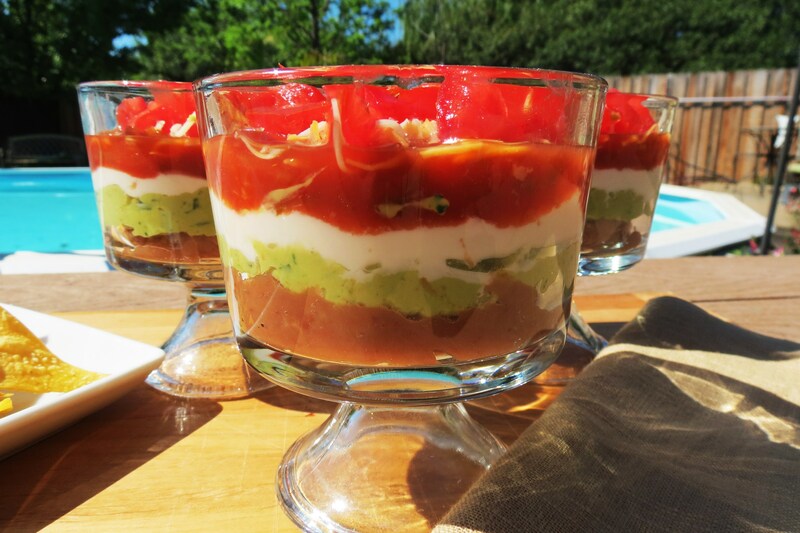 I love seven layer dip, this is such a perfect idea! Thanks Alex! I love it!! Bright and sunny and looking yummy!!! Okay Jenn, so first of all, you need to tell your husband to put the jelly beans in little glass bowls, THEN you could have some portion control 🙂 – but not me, I would eat all the bowls clean! 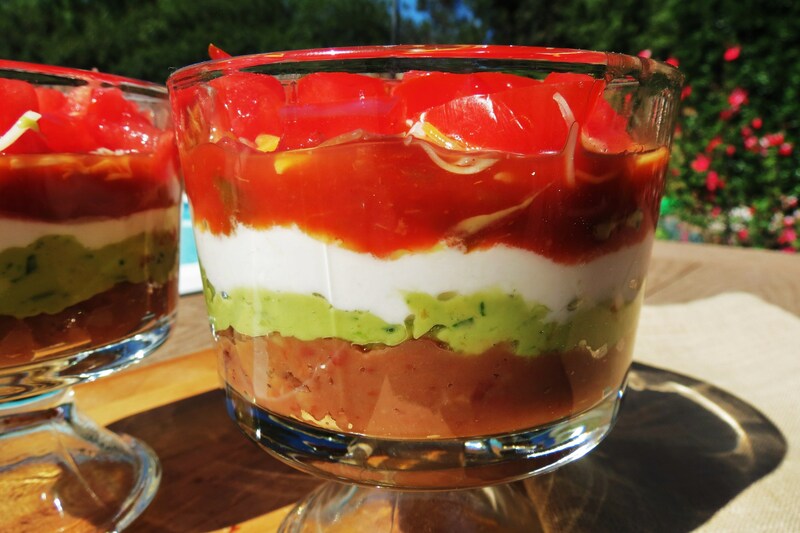 Looks delicious and healthy, love the portion control!! Thanks for linking this up to our Super Bowl party. This looks so good. I think the homemade tortilla chips are ok. It certainly works well for portion control. I can’t let an entire bag of those chips go to waste by not eating them. I’m with you! I had a bag in my hand, and put them back! I love tortilla chips!